Born in Arizona, Alice moved to Colorado in 2001 which she now calls home. She is the mother of four daughters and loves spending time with her family, especially her grandchildren. With many years of leadership and servicing experience, Alice finds great fulfillment as she assists people in the office, neighborhood, and community. 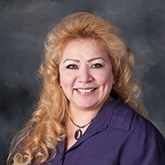 She loves helping people with their unique insurance needs and utilizes her fluency in English and Spanish to benefit all she associates with.